After he spoke at the U.N. General Assembly, President Obama declined to answer questions on whether he had asked the Iranian president for a meeting or whether they would meet and shake hands. "Thanks" was all he said. François Hollande, France's president, is next up at the U.N. General Assembly speaker's podium. He follows the leaders of Chile, Bulgaria and Mozambique. French President Francois Hollande is now at the podium -- and he's starting with Syria. "The honor of the United Nations is to act for peace, and in Syria it is urgent," he said. French President Francois Hollande credits pressure from France and other nations, including the United States, for leading to the current negotiations "under way to ensure the verification and destruction of chemical weapons" in Syria. Hollande said a Geneva peace conference on Syria must be devoted to establishing peace and a political transition with elections. All countries that accept this goal, he said, would be welcome to the negotiating table. One of the glimmers of hope in the Middle East, Hollande says, is found "in the statements of the new Iranian president, because this shows there has been development." He is referring to new Iranian President Hassan Rouhani's calls for greater international cooperation on tough issues, including Iran's nuclear program. The question to pose now, Hollande says, is whether words will be put into action, specifically on the nuclear issue. Hollande made reference to Africa and noted the "barbaric attack" in Nairobi as an example of terrorism. He said victories are indeed possible against terrorism, citing the French intervention in Mali. The "international community," Hollande said, "must assist African states to protect themselves." Backing up a little bit: While Hollande was talking about Syria minutes ago, he called on the U.N. Security Council to take up a resolution that would hold accountable those who carried out a chemical weapons attack on August 21 on the outskirts of Damascus. A resolution backing up a Russia-U.S. agreement on getting rid of chemical weapons in Syria has been in the works -- but it's been unclear whether the resolution would call for perpetrators to be held accountable. Hollande finished his speech. Next up is Jordan's King Abdullah II. Video: President Obama tells the U.N. General Assembly the U.S. is determined to block Iran from making nuclear weapons. Jordan's King Abdullah II started his speech on the subject of neighboring Syria: "The Syrian crisis is a global, humanitarian and security disaster." Syrians have fled to Jordan for safety during the civil war. Christians in Middle Eastern and Muslim nations have endured their share of persecution. 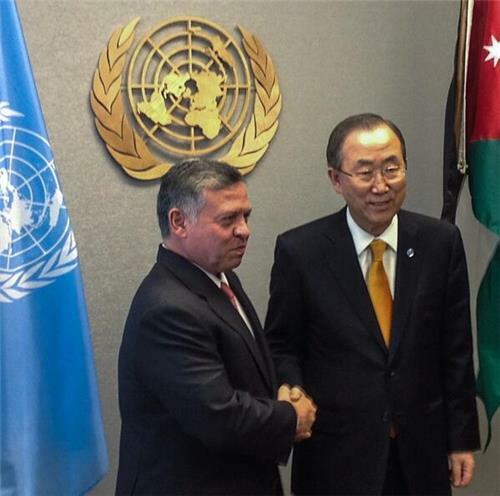 Jordan's King Abdullah II said his country has been a "historic model" for Muslim-Christian relations. He said Jordan will continue "to do" its "utmost to protect" Arab Christian communities and people. As part of an argument that the world needs to work for an end to violence in Syria, Jordan's King Abdullah II warns that the number of Syrian refugees coming into neighboring Jordan is becoming too much for his nation to sustain. He said the number already represents 10% of Jordan's population -- and it could be 20% by next year. "These are not just numbers -- they are people" who need food, health care and more, Abdullah said. "Not even the strongest economies can absorb this demand on infrastructure and resources, let alone (a small country) and the fourth water-poorest country" in the world. Jordan's Abdullah commended Israel's prime minister and the Palestinian president for pursuing peace talks and urged that there "be no actions to derail" the negotiations. He cited settlement construction and "unilateral actions that threaten the status quo" as obstacles that would scuttle peace talks. Abdullah has finished. Seven speakers are left in what was supposed to be the "morning session." Once again, here is the full list of today's 34 speakers: http://gadebate.un.org/. We're on No. 13. New Iranian President Hassan Rouhani -- scheduled for the afternoon session -- is speaker No. 24. We were speculating earlier about whether Obama and Iranian President Hassan Rouhani would run into and perhaps shake hands at the United Nations today. If it does happen, they won't do it at lunch. Rouhani skipped the lunch -- forgoing a chance to cross paths with Obama -- because alcohol was being served, Iranian state-run Press TV reported, according to CNN's Reza Sayah in Tehran. And now we know: Obama and Iranian President Hassan Rouhani won't meet informally at the United Nations this week, even on the margins for a handshake, two senior U.S. administration officials told reporters. The officials said such an encounter proved too complicated for Iran back home. Earlier Tuesday, a senior administration official said the White House had "left the door open" to some kind of face-to-face interaction between the presidents. Liberian President Ellen Johnson-Sirleaf has begun speaking to the U.N. General Assembly. She will be followed by Iranian President Hassan Rouhani. Deputy ambassador Rosemary Di Carlo is sitting in hall for Rouhani's speech, the highest level U.S. official to sit in for an Iranian president's speech in years, a senior U.S. administration official says. Rouhani also says his country "does not seek to increase tensions with the United States." He says he listened carefully to U.S. President Barack Obama's earlier speech and hoped that the United States "will refrain from following the short-sighted interests of warmongering pressure groups" so that the two nations "can arrive at a framework to manage our differences." Israel's Intelligence Minister Yuval Steinitz told reporters at the United Nations: "Today ... we heard nothing really new from Tehran." "We heard a lot of new rhetoric, but zero new steps or even zero new commitments to meet the U.N. and Security Council resolutions (on Iran's nuclear program," Steinitz told reporters.